Barry Munday, based on the novel Life is a Strange Place by Frank Turner Hollon, stars the regularly dashing Patrick Wilson (The A Team) in a distinctly un-Patrick Wilson-ish kind of role. Definitely not the Patrick Wilson we’ve seen in Watchmen and Little Children. Wilson’s playing against type is the chief pleasure in this movie. His inevitable transformation from an overgrown, aimless local dude to a thirtysomething who decides it’s time to move forward is well-played, though the overall tone set by writer/director Chris D’Arienzo (writer of Broadways’ Rock of Ages) isn’t overly funny or dramatic. Even the loss of Wilson’s manhood isn’t played up. So why include it? The points that Barry Munday tries to make about responsibility and age come across lazily — like Barry himself in the first half of the picture. The dialog and editing could have been livened up a bit too. A supporting cast of familiar faces makes the story go down easy, though. The always-game Greer overdoes it a bit, but she’s still fun as Barry’s mousy maybe-mother-of-his-baby. 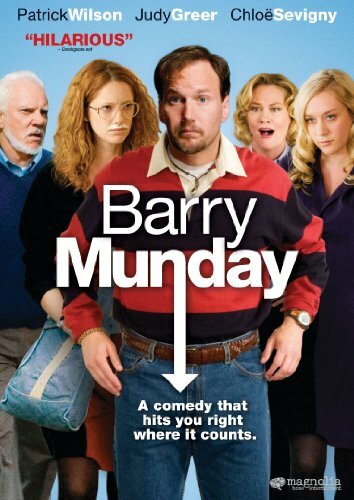 Missi Pyle (Galaxy Quest), Chloe Sevigny (TV’s Big Love) and Jean Smart (Youth in Revolt) all pop up as the other women in Barry’s life, with Smart standing out as Barry’s surprisingly calm mother. The generous supplemental package on the DVD includes outtakes and a blooper reel, revealing the cast to be having a lively time during the shoot. We wish more of that energy appeared on the screen.